Current predictions are for air transport to continue its ever increasing growth of around 4 – 5% per year, and this provides one of the major challenges facing the aerospace community: how to develop aircraft designs that are much more environmentally friendly? Jonathan Cooper from the University of Bristol explains how the EU is funding research to achieve this goal. The EU’s FLIGHTPATH2050 initiative has set many challenging goals for aviation manufacturers and researchers. There are several key aims in this scheme and include meeting society’s future needs for air travel, which requires a large increase in the number of aircraft that will be flying in the next few decades, particularly in the Far East. Consequently there is a great need to protect the environment and enable the use of sustainable energy and alternative energy sources. The initiative sets key targets including a 75% reduction in CO2 emissions and a 90% reduction in NOx emissions, all relative to a typical new aircraft in 2000. A further objective is to protect the European aerospace industry through development and exploitation of cutting edge research and education leading to market-leading aircraft designs. Vibration Testing of the ETRIOLLA Wing. Less weight– this has led in recent years to the widespread use of composite materials in aircraft manufacture as opposed to aluminium alloys. The manufacturers still need to ensure that the structure is still strong enough to withstand all of the loads that an aircraft is subjected to throughout its life. It is also very important to consider the interactions between the structural deflections and the aerodynamic forces. Wind Tunnel Testing of the ETRIOLLA Wing. The EU is currently funding a large number of collaborative research projects involving academia, research establishments and industry, focussed upon developing solutions to the above challenges, mostly coordinated under the Horizon 2020 and CleanSky funding schemes. One such collaborative project is ETRIOLLA (€4.2m) which is a collaboration between IBK (Germany), FOI (Sweden), University of Bristol (UK) and Re Fraschini (Italy). 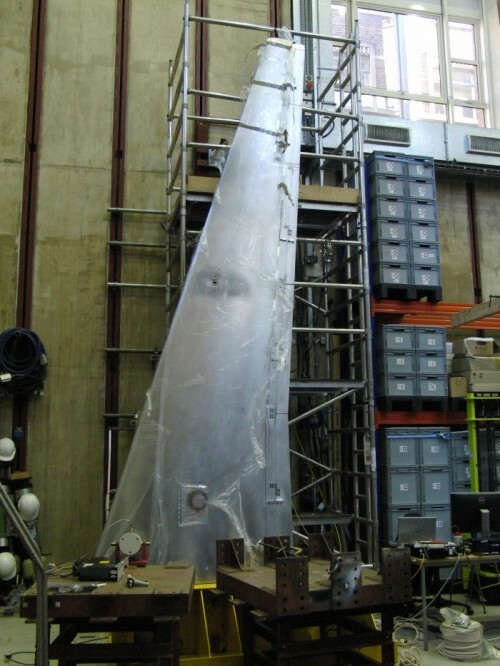 The major outcome from this project was the design and test of a 6m long wind tunnel aeroelastic wing model in order to demonstrate laminar flow and loads control on a transonic wing. 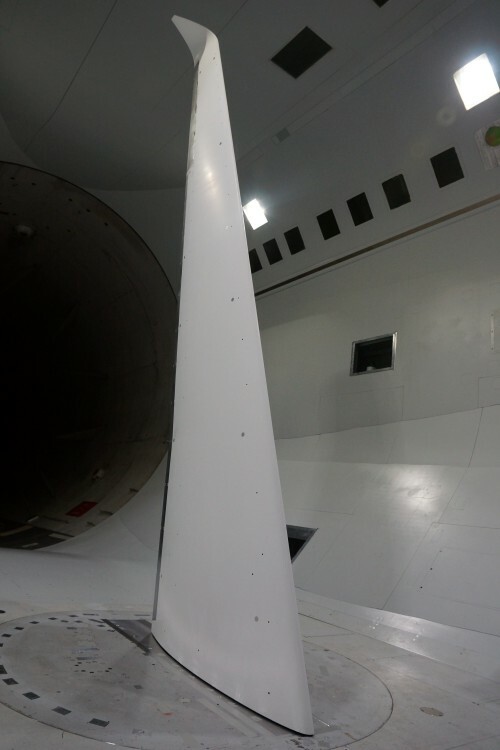 Static and dynamic vibration testing was performed at the University of Bristol to validate the numerical Finite Element models, ensuring safety of the model in the wind tunnel. The model was then tested in the ONERA S1 wind tunnel at up to Mach 0.74 (nearly three quarters of the speed of sound) with detailed measurements of the aerodynamic flow behaviour and resulting loads on the wing being made. These tests were the first time that such a large scale demonstrator of this sort had been attempted at near cruise flight conditions. Laminar flow was obtained for nearly 70% of the upper wing surface and around 30% for the lower surface. Trailing edge control surfaces were used to optimise the off-cruise aerodynamic behaviour and loads on the wing. Such tests are an important step towards enabling the use of these technologies on future aircraft designs.